Sure to be a favorite! 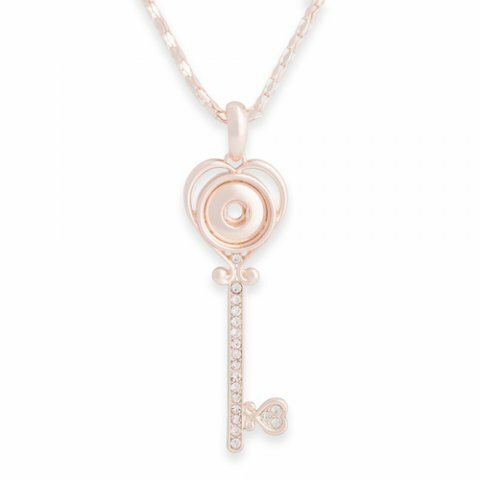 Our Rose Gold Key Necklace is beautifully wrought with dual heart shapes, covered in bling and hanging on a most exquisite chain. Snap in one of our lovely Rose Gold Dots to create an even more stunning look. I love Rose Gold. I have this piece and just ordered some earrings to go with it. I have always had problems finding jewelry that doesn't break me out and I am so excited that Style Dots jewelry does not. It is great quality. This is my favorite rose gold necklace. Just ordered the rose gold earrings to go with this. Love the bling ! !